I don't know what to think about Tim Burton. While he seems to excel in making dark and moody films such as Sweeney Todd: The Demon Barber of Fleet Street and Ed Wood, he makes some pretty mediocre children's films. Yes, that's Charlie and the Chocolate Factory, a.k.a the worst movie I have EVER seen. So, Alice in Wonderland was looking pretty average for me. Let's just say, it's a major improvement on Charlie and the Chcoclate Factory, but then again it is WAY too dark to be a genuine kids movie. 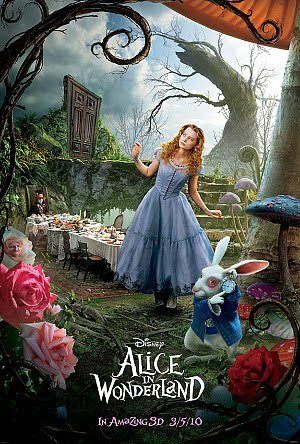 Okay, so you probably know the story of Alice (Mia Wasikowska), who falls down a rabbit hole and ends up in 'Wonderland'. There she meets some interesting characaters, including the Mad Hatter (Johnny Depp), the evil Red Queen (Helena Bonham Carter), the White Queen (Anne Hathaway) and various other weird and wild creatures. Alice gets caught up in this world, and must choose the path in which she wants to take. While, at first glance, the casting seems spot on, it really isn't. Johnny Depp and Helena Bonham Carter seem forced into their roles because of their once successful working relationship with Tim Burton. Johnny Depp is by no means the star of this movie, but passes as a lesser version of Heath Ledger's the Joker. I was pretty excited when I heard that Anne Hathaway was going to play the White Queen. Sadly, despite her best intentions (and her being my favourite actress), she dismally fails to be pure and regal--whether that be because of her white hair and black makeup or just her general appearance on screen. However, Mia Wasikowska is perfect as Alice, and really carries the film from start to finish. This version of Alice in Wonderland is not one you'd want people under 10 years of age watching. It is way too violent for it's PG rating, and will probably scare little kids to the point that they will have nightmares about the Cheshire cat. Despite this, it is quite an entertaining and admirable adaption that will hopefully be popular among fans. It is a true visual masterpiece. It's an average movie, with some amazing special effects and scenery, but the cast lets it down.